Just a quickie, here is an old darling of mine which I recently resurrected… Fear his wrath! This character was like 90% finished back in 2004 for a SpinQuad challenge / thing, which I never had the time to complete. I’ve been cleaning up my old folders and content directories, getting rid of old crap and revived a few things that had fallen into the dark shadows, hiding under the dust, but deserved to be brought back to life. This Ninja guy is one the latter. Back in march I fixed his topology, made some new UV unwraps and updated his textures and created a new clean rig to animate him. This test render is also from march while working with the rigging. 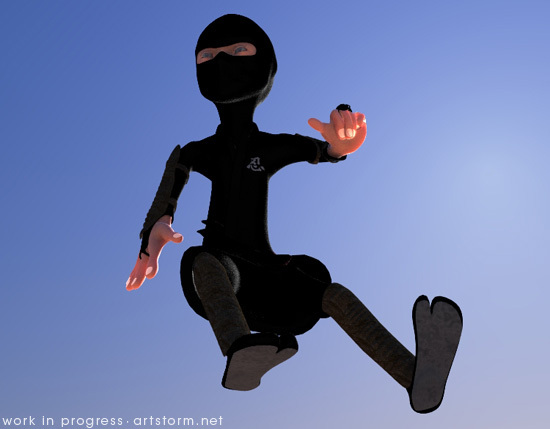 I’ve always liked this character and have had some great fun animating him when I originally created this cunning Ninja, so I am pretty psyched about finally having the time to get him finely tuned and bring him to full life. Get ready for some tough, serious, Ninja action! Man, I need to learn how to animate..